Bora Bora is another incredible strategy game from Stefan Feld. In summary: …players build huts and populate them with men and women, who help them during the game. Additionally they will send priests to the temple to influence the Gods. Players use dice to perform a variety of actions using careful insight and tactical planning. Players compete to gather the most points over 6 rounds of play as they explore and settle 5 islands. Each of the rounds starts with the players each rolling 3 dice of their color. In turn order and turn order is critical, players place each of their dice on one of 7 action tiles. When placing a die on an action tile the value of that die must be lower than the lowest value of die already occupying that action tile. This provides ample opportunity to mess with your opponent’s plans. Action tiles allow players to expand hut locations, place priests in the temple, take man and/or woman tiles, construct buildings, or use a helper action. The helper action gives the ability to trade for resources, activate man and woman tiles, and claim one of 5 different types of god cards. Activation of man tiles yield tattoos for advancement on the status track, which will affect turn order and award points at the end of the round. Activation of woman tiles will yield shells that will be used to buy jewelry which yield points at the end of the game. The 5 god cards can be used to make better use of your dice, or help score points, or to complete tasks at the end of each round. The second phase of a round allows each player to utilize the actions depicted on one of their man tiles and on one of their woman tiles. There are 12 different action available on the tiles. Players will want to have both man and woman tiles and a variety of actions available to them as the game progresses. The third and final phase of each round encompasses various scoring sections, establishing turn order for the next round, jewelry purchase option, and replacement of one of a players’ completed task tile. This process is outlined in a special section of the board. The status track awards victory points based on the number of tattoo’s your men have acquired that round. This is where turn order for the next round is established. The next track is the Temple track. Players scored victory points for the number of priests on the Temple track and the player with the most priests is awarded a special God tile. Next is the jewelry market where each player has the option to purchase a jewelry tile that will be worth victory points at the end of the game. And, the last section in this phase is the task tile scoring and replacement. Any one tile that a player has completed during the round receives its applicable victory points and is then replaced with a new task tile. The game ends after 6 rounds. Additional victory points are awarded for having huts near fishing grounds, for having huts in every region on the 5 islands, for any acquired jewelry tiles, and an added bonus if jewelry tiles were acquired in each round, for completing all tasks, for completely filling their building area, and for having all 12 man/woman spaces filled. 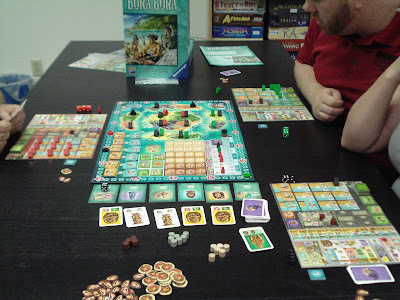 Bora Bora is definitely a gamer’s game. There is a ton of interesting decisions to be made. Points can come from many directions and the many different task tiles will encourage players to take a different approach each time they play the game. There are many interesting adventures on the way to Bora Bora. 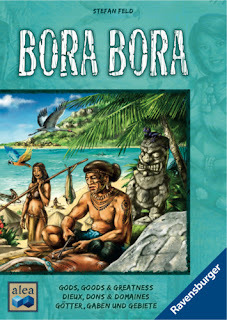 We have an open copy of Bora Bora available in our Store Demo Library for you to come in and try out.